I’m 6’4″ (193 centimeters), so I’m not sore about heightism personally. I just think it’s increasingly a bad idea. Evidence for discrimination against short men is widespread. It’s not true that the taller candidate always wins, but truly short men don’t get nominated very often. Michael Dukakis (5’8″) was the shortest recent male candidate (although the 72-year-old John McCain, who is listed at 5’9″, might actually have been shorter when he ran due to age and the beatings he endured in North Vietnam). Dukakis was widely made fun of during the 1988 campaign for driving a tank while short, even though armored personnel tend to be small men so that they’ll fit in their cramped cockpits. Do people favor tall men because they are superior on average or are they just biased toward the tall? A clever new study from Poland compared the responses of 34 blind people with 43 sighted people to a fictional story about a man named Thomas. In half the versions, Thomas is described as 5’5″ and in the other half as 6’3″. The sighted people tended to extrapolate that Tall Thomas was smarter, wealthier, a better leader, and higher in social status than Short Thomas. The blind participants, however, didn’t distinguish, presumably because they haven’t noticed who is tall and who is short. But this leaves unanswered the question of who is more accurate about the correlations of height: the blind or the sighted? Generally speaking, the more knowledge the better, even though that is not a popular view at present. It’s striking that height prejudice isn’t demonized today, even though it has disparate impact on immigrant ethnicities. The federal government conducts the ongoing NHANES study of the sizes of Americans for the use of the apparel industry. In 2016, the average white man was almost 5’10” tall, compared with a little under 5’7″ for Hispanic and Asian men. So height discrimination benefits whites. 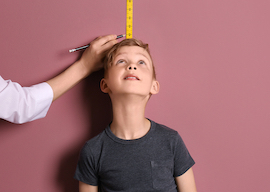 Height varies for reasons of nature (genes) and nurture (such as childhood nutrition). But the implications of that tautological statement haven’t always been thought through. It’s clearly better to have enjoyed the kind of beneficent nurture as a child that lets you max out your genetic potential for height. Not surprisingly, other people tend to want to associate with adults who look like they enjoyed pleasant childhoods due to their having affluent and caring relatives. There was often a class gap in height. In Britain during the Great War, working-class men averaged 5’3″, while upper-class toffs averaged over 5’7″. Not surprisingly, therefore, height has commonly been seen as a class marker. But as childhood malnutrition became thankfully less severe over time, the class disparities in height became less severe. As an American baby boomer, for example, I don’t recall much in the way of stereotypes about working-class males being shorter. For example, while English coal miners were assumed to be short due to their poverty, the coal and iron region of western Pennsylvania was famous for its great football players, especially its quarterbacks, such as Johnny Unitas, George Blanda, Joe Namath, Jim Kelly, Dan Marino, and Joe Montana. On the other hand, the U.S. has now reproduced the old class gap in height via immigration. I noticed this at the whitest event I ever tried to attend: an art exhibit of the abstract sculpture of Edward Tufte, author of the cult how-to book on graphs The Visual Display of Quantitative Information. It was put on at the Bradbury Building (beloved by sci-fi fans as the site of the climax of Blade Runner) on Broadway, the main Mexican shopping street in downtown Los Angeles. When I got there, however, the Bradbury Building was locked. As I stood on the sidewalk, I looked around for other Tufte aficionados to ask what was going on. But how could I pick out my fellow Tufte fans from the swarming crowds of Mexican shoppers? Well, that turned out to be extremely easy, because the Tufte admirers were uniformly white guys a full head taller than the immigrants. A half dozen of us wound up carrying on a conversation about Professor Tufte over the heads of the shoppers. While being taller by nurture is desirable, it’s not clear that being taller by nature is always better. You’ll notice that humans haven’t constantly evolved to be taller, because there are numerous trade-offs. Europeans tended to prefer tall soldiers, such as Prussian king Frederick William’s Potsdam Giants regiment, which featured a minimum height of 6’2″ and a number of seven-footers. On the other hand, as Francis Galton pointed out 150 years ago, larger soldiers are more likely to get killed by projectiles on the battlefield. The Olympics offer dozens of different sports, with wildly different body sizes found in each. Among sprinters, for example, a wide variety of heights can be found. Still, a great big man, such as 6’5″ Usain Bolt, will likely prevail over even a great little man. On the other hand, while a superbly coordinated tall man will tend to defeat an equally coordinated short man in most sports, tall men are less often highly adroit. Likewise, distance runners are seldom particularly tall because the extra weight pounds down their joints. An awareness of heightism first emerged in the early 1970s. The word “sexism” first appeared in print in 1968, and “heightism” naturally followed in 1971. On the other hand, enthusiasm for deploring heightism has largely faded. In the past, when height was a fairly good class marker of better nurture, it made sense for women, who tend toward class hypergamy, to prefer taller men. But as height has evened out within ethnic groups due to most everybody in America getting decent nutrition, height is now highly heritable and therefore ought to be less of a status symbol. Is it still rational for women to be as prejudiced about masculine height as in the past? Perhaps not, but it isn’t much debated at present, because criticizing women’s heightism seems like sexism. Our culture has increasingly lost interest in general principles and instead thinks, like Stalin, in terms of “Who? Whom?” Punching down at short men is fine these days because they are men, and thus are assumed to deserve to be whomed.